Appear builds solutions for longevity, scalability and efficient operation. Centered on an evolving system philosophy, the ability to mix and match functionality means different applications can be handled simultaneously. There is nothing preventing an operator from catering for different market segments in the same system. Ease of upgrade and interchangeability massively extends the lifeline of an Appear solution, significantly reducing OPEX and increasing ROI. Regardless of requirements, the diverse product portfolio caters to the magnitude of requirements within professional video networking. Appear offers all components covering the terrestrial video and audio distribution chain. Carrier class video and audio compression is done by use of novel statistical multiplexing technology. A full featured multiplexer, Simulcrypt interfaced scrambling and integration with all prominent CA vendors ensure universal terrestrial applicability. A dedicated DVB-T2 gateway application implements T2MI streams centrally for distribution to the transmitter sites. PLP replacement and re-multiplexing on various sites enables local programme insertion. A turnkey Appear solution for reception from primary distribution feeds, e.g. 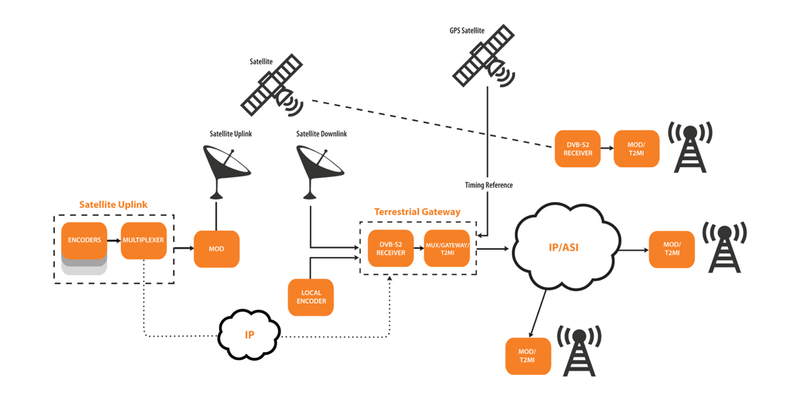 satellite/terrestrial signals, to reception from other contributing networks, such as IP. The operator is free to mix and match any combination of programmes to be included in the cable offering. Incoming programmes are descrambled, either by CAM-, SIM-, or software-based CA support. Programmes can be directly included in output multiplexes, or transcoded with a new codec or bitrate scheme. Transcoded programmes can be statistically multiplexed for maximum bitrate allotment. Market-specific features include a built-in MPEG multiplexer with advanced functionality, individual component handling and PSI/SI table management. The multiplexer provides muxes on IP for distribution to remote head-ends for digital or analogue “to-the-home” distribution. The multiplexed signals can also be QAM modulated directly into the HFC network. Local web-based user interface for configuration and patented redundancy for signal paths and equipment, the solution features open API ensuring integration with external management and control systems. Appear provides the complete solution for audio/video processing within TV satellite distribution. Carrier class video and audio compression is achieved by use of novel statmux technology. An integrated DVB Simulcrypt scrambler module works with all major CA vendors, and the satellite modulator supports the latest DVB modulation schemes. Operators have full flexibility to adapt channel line-up with the required satellite frequency plan incorporating PSI/SI/ATSC signalling. A resilient and durable platform, the Appear satellite head-end offers several advanced redundancy schemes for both signal paths and equipment. Local web-based user interface for configuration, control and monitoring, the solution provides an open API for integration with external management and control systems. Within the OTT domain, Appear offers an extensive solution for adaptive bitrate streaming to any user device. The system includes all parts of the live video chain in addition to VoD. Transcoding solutions to multiscreen video profiles are provided by either an efficient dedicated hardware solution or alternatively a flexible software server cluster that can be deployed either on premise or in the cloud. Storage possibilities enable catch-up TV, nPVR, and VoD services. The system features just-in-time packaging to any streaming format and is integrated with the majority of DRM vendors in the market, as well as CMS and Middleware systems. The Appear TV origin server can deliver directly to clients or to one or multiple CDN providers. Designed for exceptionally high availability, any one failure in the system results in no or an absolute minimum of signal loss. Professional grade equipment catering to many of the largest operators in the world. Appear head-ends can be built and customized according to a myriad of requirements, due to the interchangeable and modular nature of the platform. 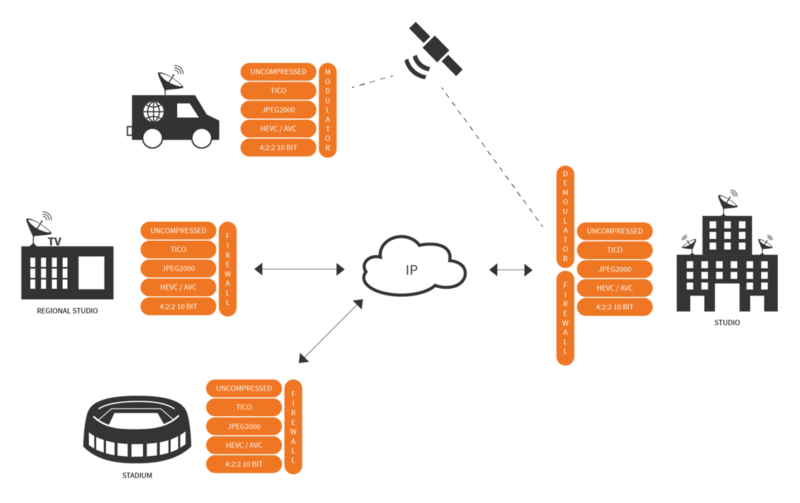 The resulting system-in-a-box features interfaces capable of handling primary and secondary distribution networks (satellite, terrestrial, cable, IPTV). Incoming programmes are descrambled, with either CAM-, SIM-, or software-based CA support. Adapting to the “in-house” distribution network, the output can be a modulated multiplex for internal cable TV network or IPTV streaming services in an internal Ethernet based network. Every aspect of operation can be done within a single chassis – control and monitoring is intuitive through a web-based user interface. The solution is optimal for projects of scale as management can be done remotely. The dedicated, highly compact, modular Appear contribution platform supports optical/electrical SDI conversion to/from SDI-over-IP. Built to handle bitrates in the uncompressed domain, as well as compression in the contribution market, it supports TICO, JPEG2000, AVC and HEVC with ultra-low-delay mode. Interoperability and standards compliance is a key asset of the platform. It has specifically been designed for an IP-based or a satellite infrastructure, where the satellite modulator and demodulator supports the higher order modulation schemes. 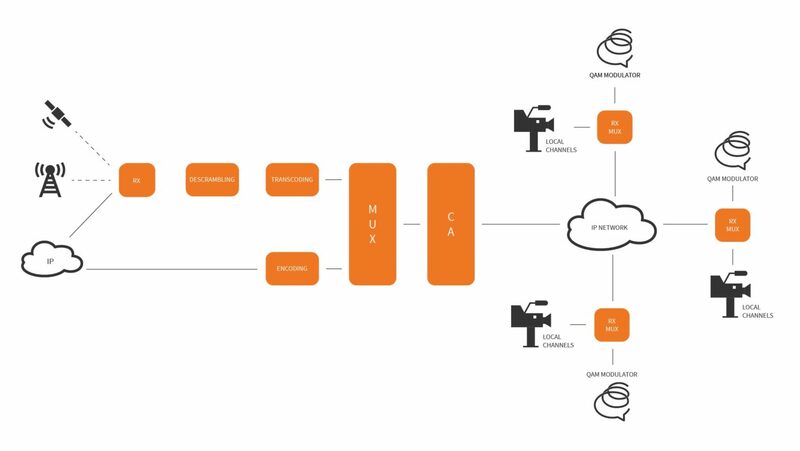 For IP-based systems, the platform has a default video firewalling functionality for seamless and secure video handling of thousands of streams simultaneously. Encoding and decoding is supported within a single application. Redundancy is ensured through an intuitive and efficient user interface where full control is achieved by external scheduling and monitoring of all operation. The benefits of a “living system” entails significant economical and operational advantages, both long and short-term. Less space is needed to do more, while complexity and power requirements is kept at a minimum. Appear delivers complete solutions for any market. Please get in touch if you have a specific project in mind – regardless of size or geographical location.